The location is perfect. 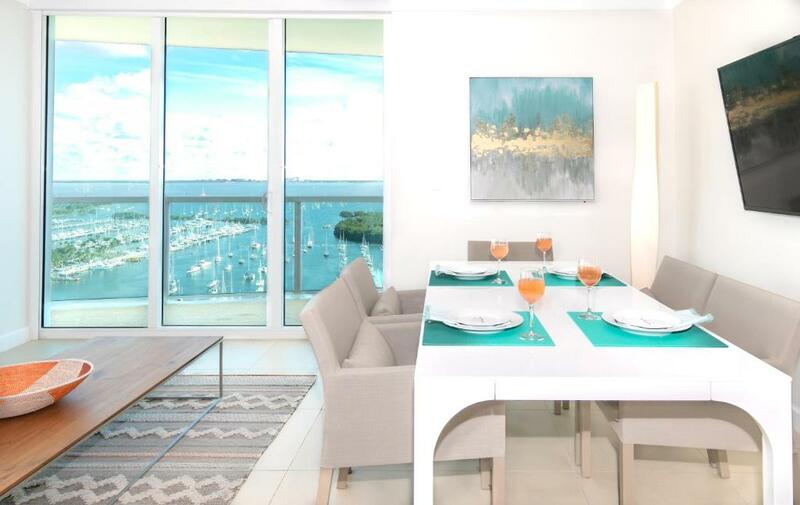 Easy access to Coconut Grove restaurants and beautiful views over Biscayne Bay. 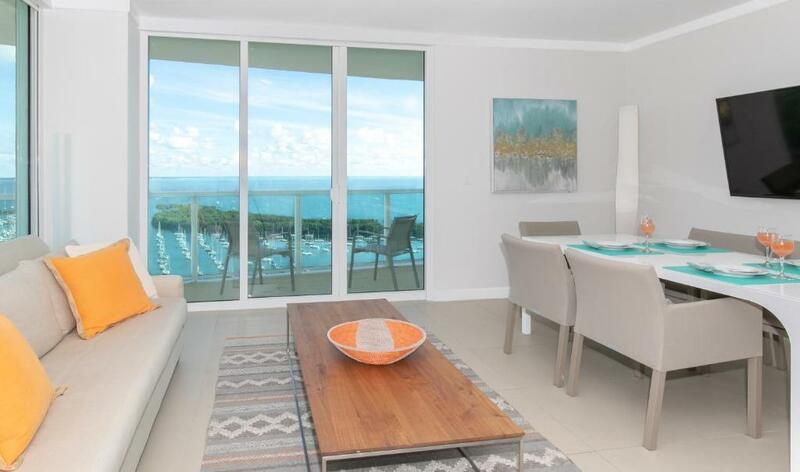 The location is perfect for everything in Coconut Grove, while still being private and quiet. The terrace bar at the location is really beautiful. Good value overall. Nice part of town. Friendly hosts. Easy to get to. Very clean. Wow! The apartment was way above and beyond my expectations. The decoration was just like in the pictures. The views were the best ones I have ever enjoyed in any apartment or hotel. What I loved most was the wrap-around balcony where I would sit for hours looking at the ocean. New kitchen, new everything. Simply, a gorgeous property. Thanks to you guys for such a unique experience! 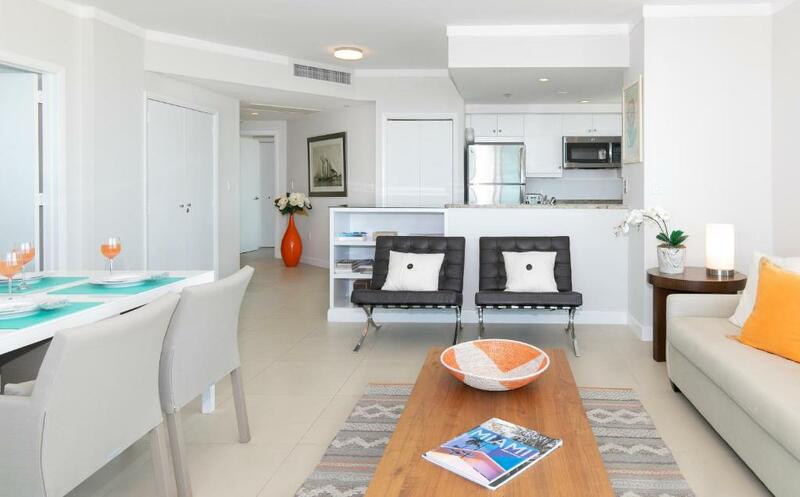 Loved this newly refurbished property inside Sonesta Hotel. It was spotless clean and full of nice details, includiing water and wine in the fridge upon arrival. Kitchen is fully equiped and beds were comfortable. Nice views to the bay. Internet worked much faster than hotel's and I was able to connect TV to watch Netflix signing in with my own account.Parking in the same building is free. You can use all Sonesta hotel facilities: pool with amazing views, gym, restaurants....Checking in and out was smooth and easy. From now on, I will stay here everytime I come back to Miami. Loved the place! 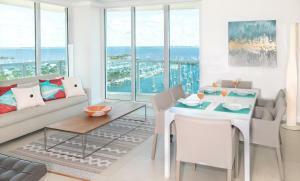 I ​travel to Miami ​quite often​ and have experimented with other properties in the building and in the area. When I arrived, I was very pleased with the decoration and cleanliness. Everything was as in the pictures, tasty, modern and​ well maintained. I will​ definitely reserve this property ​in the future​. Although I travel​ed​ alone, this studio could accommodate up to 4 people​. As a nice plus, the rental ​price include​d​ a covered parking space in the building​, linked to the main elevators​.​ I felt very safe arriving late at night.​ F​or the reservation, communication​ with​ Silvia was smooth​​. ​I ended up using the gym everyday in the morning and it was energizing to see the park and city from atop. Coconut Grove is a nice area full of small and cosy restaurants and the staff at the hotel were always nice and trying to help. ​ Next trip I may come with my husband and on that occasion the kitchenette will come in handy. Thanks! 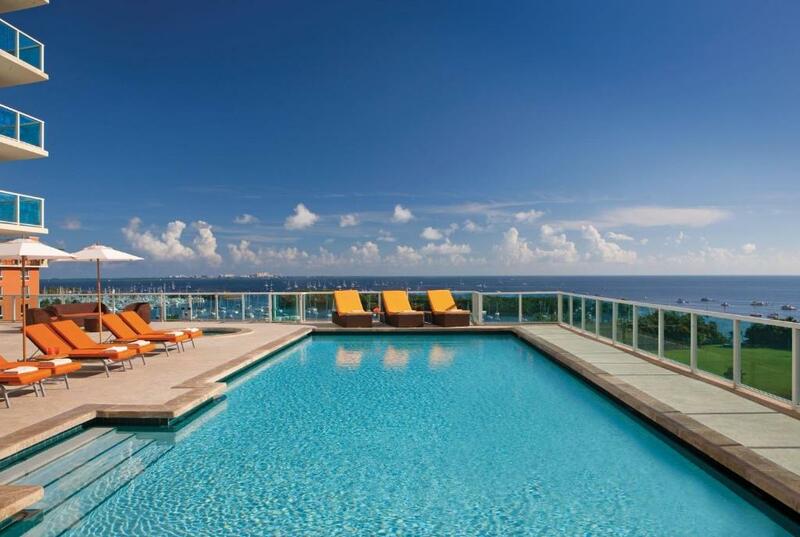 Providing an outdoor swimming pool, Coconut Grove Apartments features accommodations in Miami. Complimentary WiFi is available. 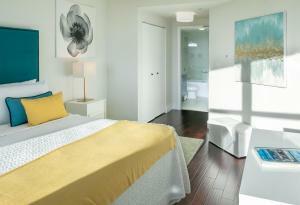 The apartment offers a flat-screen TV and a private bathroom with free toiletries, a hair dryer and shower. There is also a kitchen in some of the units equipped with a dishwasher and oven. The restaurant at Coconut Grove Apartments specializes in international cuisine. The property has a fitness center. A bicycle rental service is available at the accommodations. Cocowalk Shopping Center is 2,300 feet from Coconut Grove Apartments. Miami International Airport is 6.8 mi away. 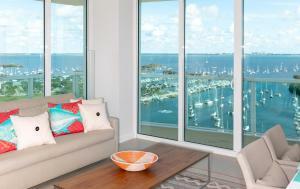 When would you like to stay at Coconut Grove Apartments? Miami’s weather is pleasant all year round, which allows people like us to enjoy the city’s incredible range of activities. From outdoor sports, to a vibrant art and design community, to performing arts and events of all kinds, Miami has never been more busy and sophisticated. Coconut Grove has a very special flavor, with lower buildings and a trendy atmosphere and within it, this is a unique building facing the ocean, the marina, the islands and next to Peacock Park. After living in four continents, my husband and me decided to open a boutique hotel and we returned to Asia to look for the ideal piece of land. Finally, we realized that we were in love with Miami and that we could build our dream here. We met while we both while were working in tourism. I have a Master in Tourism Administration and my husband a Ph.D. and and MBA and we enjoy meeting smart, sophisticated people. For us this activity is not just a job. We love what we do and we try to do it better every day. Silvia is critical to our success. She oversees bookings and leads the customer service side of the business. Together with the on-site manager she routinely delivers the best experience for our clients. We are also property owners and from the beginning we have helped investors manage their apartments, always in authorized buildings and in accordance to county and state laws. I hold a Master in Tourism Administration and an Interior Designing degree. My husband is a Ph. D., an MBA, and a Florida Licensed Real Estate Broker, and together we speak six languages, which allow us to interact with our clients like no other company. Hotel amenities, assigned free covered parking. Unique place, the house of many famous refined souls with privacy in the middle of everything you may desire. “The Grove” is a trendy, artistic neighborhood on the coast of Biscayne Bay adjacent to Coral Gables located at minutes from downtown Miami’s Business District, the Port of Miami, South Beach, Coral Gables, the University of Miami and the beaches of Key Biscayne. House Rules Coconut Grove Apartments takes special requests – add in the next step! A USD250 damage deposit is required on arrival. This deposit will be fully refunded 7 days after check-out, as long as there isn't any damage to the property. Coconut Grove Apartments accepts these cards and reserves the right to temporarily hold an amount prior to arrival. Daily maid service is not included, but it is available for an additional fee of USD 25.00 per hour paid directly to the housekeeping staff. Please note the cleaning fee is for a final cleaning after check-out. Parking is only available for apartments and studios. Please inform Coconut Grove Apartments of your expected arrival time in advance. You can use the Special Requests box when booking, or contact the property directly using the contact details in your confirmation. A damage deposit of USD 250 is required on arrival. This will be collected by credit card. You should be reimbursed within 7 days of check-out. Your deposit will be refunded in full by credit card, subject to an inspection of the property. The apartment was different then the one pictured when booked much smaller and was not as fancy. But if they used the correct pictures it would have been fine. The room was smaller than we anticipated. Booking.com didn't have any photos of the type of room we actually selected. The check-in and checkout processes were unnecessarily difficult. There’s no on-site management so you have to coordinate everything by text message and phone calls. I was texted multiple times about things I’d already provided at bookings.com. The room itself was fine but the air conditioner was very noisy and the view was not quite as billed- You have to go out on the balcony to really get a look at Biscayne Bay. Ridiculous fee for being late when I could just easily sign in at the front desk. Led me to have my drivers license compromised. False advertising in that it looks as if you are getting a full apartment and you are only getting a hotel room. I am still fuming about that. Pool was being drained and inoperable. Would have been nice to have known that beforehand. I really believe I need to get a discount on this room. I am very Leary of the people who run this place based on the above. It was really very deceptive in its advertising. I loved the view from my balcony. My stay was so short!